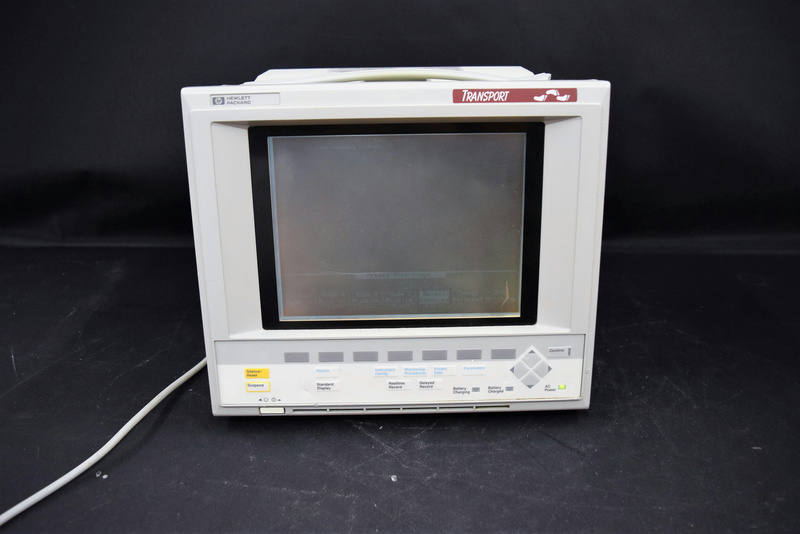 Hewlett Packard M1277A Transport Portable Patient Monitor w/ Module Rack M1276A . New Life Scientific, Inc. The HP monitor can be operated on either AC or DC power. This unit comes with a power cord, if you want to use the DC power new batteries will be required. It has a 10 diagonal monochrome screen. The module rack on the rear of the unit will hold modules to monitor ecg/resp, nibp, spo2, and printer. These modules are not included with this monitor and will have to be purchased separately. NLS technicians tested, Powers On/Off, buttons work, screen is very dim. No further testing was done. Has some scuffs and chips out casing, the screen is very dim. Powers up, and buttons work. Has some scuffs and chips out casing, the screen is very dim. Powers up, and buttons work.